LTG is thrilled to announce Ms. Cumber has been promoted to Director of Human Resources. 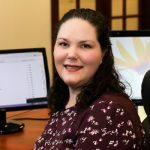 Lauren joined LTG in 2017 as assistant to the CFO. Her expertise, insight and energy have had a profound and positive effect on the company. In her new role, she is responsible for developing and leading all Human Resources programs, policies and processes for the firm. Please join us in congratulating Lauren on her promotion!